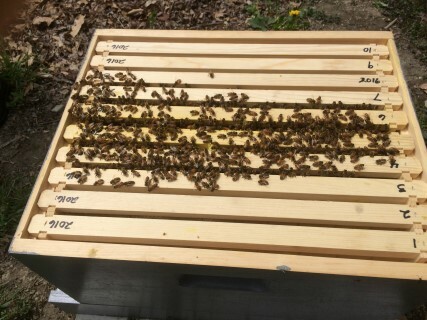 Due to the profound interests in backyard beekeeping, join beginner apiarist; Lorraine Glowczak, as she shares her discoveries on her new adventure of keeping honeybees in this monthly series article. My month long adventure with the honeybees has been filled with exciting observations, introducing me to those sweet little Italians on a greater level. The experience has been sprinkled with apprehension and a learning curve or two. But more importantly and as I had hoped, the bees have provided an opportunity to take a closer look at myself, learning about the ways I approach life. For example, the small flying insects validate my awareness of how busy I am and reiterate my goal of slowing down. Much like the worker bees in my hive, I buzz breathlessly from one life project to another, rarely slowing down to enjoy quiet moments. But despite my demanding work filled days, I take time, slowing down enough to check in with the bees on a weekly basis. 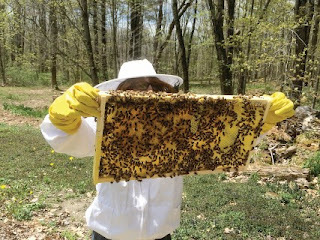 My last tale ended when the 10,000 honeybees, along with their new queen, arrived on Friday, April 29th. As a reminder, the queen bee and a few of her attendants arrived separately in a smaller cage so the rest of the swarm could adjust to the smells of their new queen. This adjustment period allows everyone to get accustomed to one another. 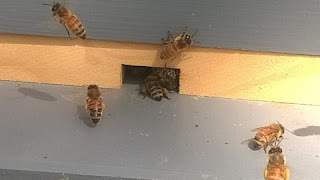 As instructed by my mentors, I checked the hive three days after the bees were introduced to their new home to see if the queen bee made it safely out of her cage and was still alive (a very important detail to the survival of the hive.) She was out of the cage but I did not find her among the rest of the bees. 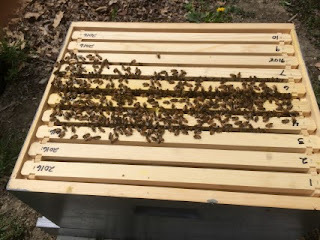 It was a cold and rainy day, so I only did a quick check with plans to take a closer look in 7 to 10 days to let the hive become more established. After I poured the correct amount of syrup, something came over me. 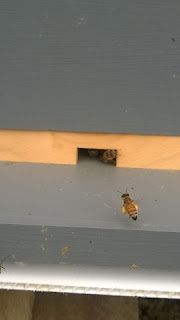 I decided spontaneously to check in on the bees six days prior than anticipated. I knew the next couple of weeks would be intensely busy and wondered if I’d find the time to check them as scheduled. As I result, I opted to take a quick moment to see if everyone was doing okay. Obviously, I went against every rule I had been taught in my beekeeping class about the proper methods of checking a hive. Without my beekeeping garb, smoker, or tools; I slowly lifted the syrup feeder which exposed the lid to the hive. Then, gently raising the lid I got to see them closely for the very first time – all 10,000 of them. It was a very cool day, so when I reached for the first frame (without gloves) I felt a thick sweet moist heat produced by their fast moving wings. I guessed there was about a 10-degree difference between the inside and outside of the hive. 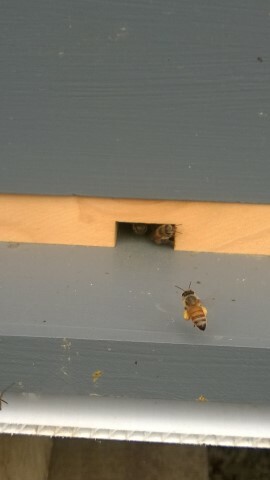 I lifted the frame away from the hive and I saw her! The queen bee was surrounded by her attendants and 10,000 other bees who were concentrating on the tiny little worm looking larvae that had already been produced in just one week’s time. The bees paid absolutely no attention to me. They were not upset by my presence or the fact that I had them up in the air intently peering in at them. As a result, any minor apprehension I had about looking at them without protection was completely absent. After inspection, I deliberately put the frame back into the hive. If I would have stopped here, I would have no story to tell except what happened thus far. But my excitement got the best of me and I could not end with just one frame. I lifted the second one away from the hive and was completely astonished. They had started on the next frame too, busy with building and expanding their new home. I fell utterly in love with my new adventure and knew that beekeeping was going to be a part of my life for a long time. Realizing it was time to leave for the Kentucky Derby Party, I slowly put the second frame back into the hive. However, this time, the frame stuck somewhat. Being as gentle as I could, I push down slightly on the frame so it would fit snug into its place. This is when things went awry. The minor vibration that was created by pushing down on the frame irritated the bees instantaneously. Without warning, about 20 guard bees rushed into my face. I wish I could say I did not panic, but I did. I wish I could say I did not get stung, but I did (under my eye and on my elbow.) I wish I could say that a few of my bees did not die in the process, but they did. 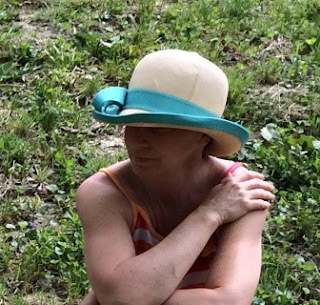 What I can say is that I learned the importance of slowing down and that working with intention usually produces better, less painful, results. Needless to say, I no longer check my hive spontaneously. Check in next month as I share the next steps in my beekeeping journey and all the new things I learn along the way. Such as, what it’s like to check your hive correctly.